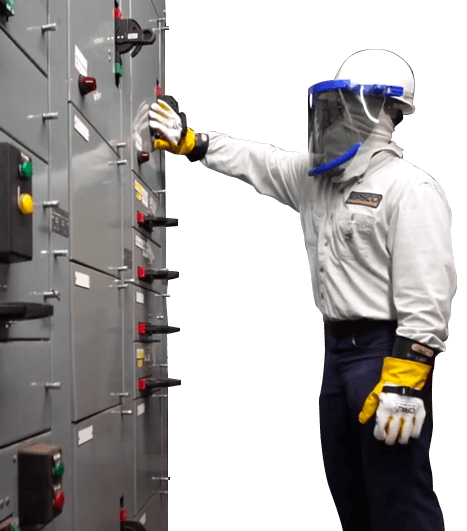 Arc Flash Study | EPSCO – Electrical Power & Safety Co.
Come for the compliance. Stay for the added value. You need an Arc Flash Analysis to comply with your NFPA 70E requirements. Our solutions are unique for a number of reasons. First, we make the tools you’ll work with easy to understand. Whether you’re a novice or expert, our user-friendly solutions will help you be better prepared for electrical issues that may arise. Next, we offer valuable insight that can help you avoid unnecessary repairs and costly outages down the road. Our engineers are licensed in 45 of the 50 states and are adept at communicating 70E requirements in clear and simple language. We’re the only safety solutions provider who offers an illustrated description of PPE on all of our labels, because it’s not enough to just be compliant. We want your team to be armed with a quick reference of what’s needed to work safely. ESPCO offers free updates to your Arch E schematic and PPE labels for five years after your study. We break your Arch E schematic into portable field level drawings that are easier to use when troubleshooting. We use the data we collect in your study to provide you with recommendations on preventing ground faults, limiting the effects of overcurrent to protective devices, safeguarding your crucial production processes, and determining the best time to replace your aging equipment. This insight could save your facility hundreds of thousands of dollars in electrical outages and production downtime. Once the decision has been made to move forward with your Arc Flash Study, EPSCO will coordinate with your group to schedule the various milestones, starting with data collection. In the data collection phase of your project, an EPSCO experienced field service technician will come onsite to your facility to gather information. Accuracy during this phase is absolutely critical as it will provide important data for our engineering team. The EPSCO engineering process will provide you with over 16 deliverables, including mitigation and coordination recommendations, a state-specific PE review, and facility schematics. The field schematics will provide your group with the opportunity to review the study’s accuracy, and it offers an invaluable resource in trouble shooting and safety coordination. Your labels will be applied by EPSCO and are designed to be easy to read and understand. The information will be delivered in your final report. Your report will be control “F” search-able and include a dashboard for quick access to a variety of deliverables, all of which will be discussed in further detail during the training. We will complete your study with specialized training for all of your electrical workers. Learn more about safety training. As part of our commitment to safety, EPSCO provides free updates and changes up to five years after the study. This helps keep your facility up to date with the most recent codes and standards. Program Management – Providing a comprehensive and managed solution through arc flash analysis, electrical safety training, PPE, Barricades, and a video based electrical safety program. Continuous Updates – Remaining compliant though the changes of your facility and NFPA 70 E is a challenge. This program is designed to help the already over burned safety manager. How much does an Arc Flash Study cost? Undertaking an Arc Flash Analysis at a facility like ours can be a difficult and overwhelming task. EPSCO proved to be a knowledgeable and valuable partner to help make the process easy and understandable. © 2019 EPSCO. All rights reserved.